"An Experience of a Lifetime!" Youth Enrichment Programs and Adult Volunteer Experiences. Ilima-Lei Macfarlane's "Ilimanator Scholarship"! An InterTribal Youth Mentor, Scholar, and Bellator MMA World Flyweight Champion Fighter, Ilima is leading a philanthropic campaign to provide "Ilimanator Scholarship" to young females who deserve a fighting chance to succeed. Ilima uses her platform to bring awareness to indigenous issues and provide holistic education and travel opportunities to young females. Application Priority Deadline April 15-22. Apply, Donate or find out more . . . 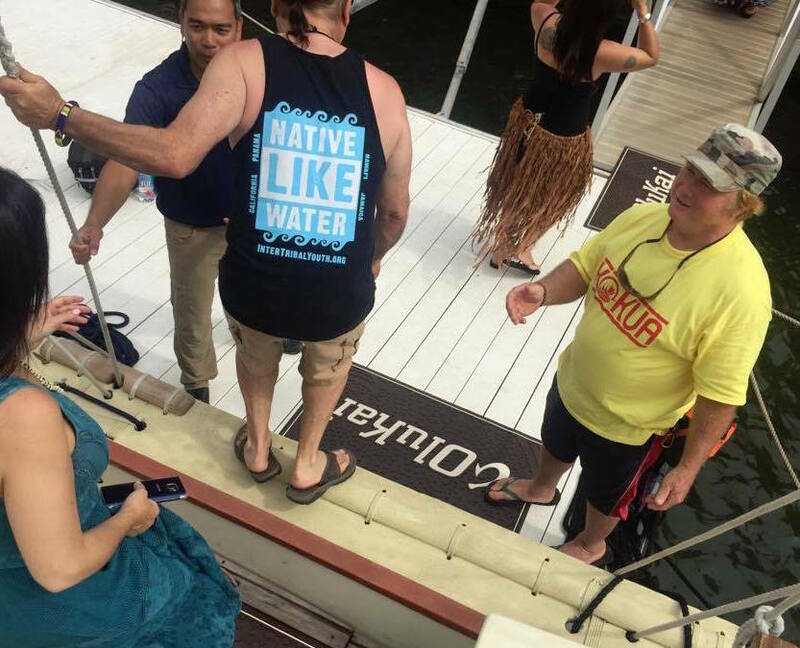 Native Like Water Overnight Voyage, San Diego, March 23, 24, 2019. InterTribal Youth Alumni set out in continuance of Native Like Water Curriculum of Indigenous Science and Coastal Culture. Youth, staff and experienced crew set on a overnight voyage to know the Kumeyaay Coast of San Diego. Open to ITY Alumni only. Contact us for more details. Jamaica Sweet 2019 Cultural Exchange and Earth Family Gathering, May 21- 28, 2019 This program is designed with no age limit. It is for youth, adults, and elders. Perfect for students, teachers, mentors, parents and extended Family. Bob Marley and Jamaica has given the world so much. Join the invitation to attend the VIP Earth Family Gathering, Kingston Community Exchange and Ocho Rios, Irie River. ﻿Program registration now open. Enjoyable learning and observations with Youth from various Nations. InterTribal Youth / Young Native Scholars Summer Enrichment Residential (18th Annual) So Cal, California. July 14-25, 2019; For ages 12-18. An eighteen-year history of curriculum and enrichment programs culturally based in science, arts, wellness and leadership. This is our flag-ship program that services youth ages 12-18 whom are considered "pre-college" and at the highest risk. Over the years, 100's of youth have been enriched locally, nationally, and internationally during residential programming and community learning. Elders, top professionals, leaders, and college-age mentors provide support staff. Program registration for 2019 is now open. Face to Face with Nature in Panama. Registration NOW OPEN. A no pressure, leisurely, Inter-generational learning and relaxing experience. The goal of the program is to introduce ourselves to the concept of Indigenous Science, have fun and build unity, knowledge and recognition with other tribal nations. Interwoven fabric of FUN knowledge that includes: environmental sustainability, biological and earth sciences, oral history, health, botanical healing, lifestyle, global climate change, and the management of natural resources. Nor Cal Sacred Canoe Journey: San Francisco, Oakland, UC Berkeley, to Alcatraz, Ohlone Territory, August 11-19, 2019 A gathering designed for ITY/NWV Alumni to join Caonoe Journey 2019 and celebrate the 50th Anniversary of Alcatraz Indian Occupation. Amongst the giants, rivers, and ocean coasts of the real Nor Cal. From the bay and beyond. California with all its diversity, is cradled by the trees and stories of our past, present and future. InterTribal Youth Big Island Hawaií June 2019 (rescheduling TBA) For Youth (12-18) and Adult Youth Teachers/Mentors A holistic approach to education is an aim to "Indigenize Education" and must includes cultural identity. Hawaiian programs are leading the way in cultural-based curriculum and is proving very helpful in western academic success. Recent studies show students exceling in tests (government school test) in the upper grade levels when Teachers "teach to the spirit, ancient knowledge, and not teach simply to the test." Join us on this beautiful island as we are hands-on, in-tune and with the kingdom of paradise. Traditional relation of Land, Ocean, and sky environments to be seen and felt. National U.N.I.T.Y. Conference July 5-9, 2018 InterTribal Youth and Native Like Water featured in the greatest national youth conference in the Americas / Turtle Island. The UNITY Fire is an eternal flame within. This summer conference and fire is hosted in OUR own hometown - San Diego - Kumeyaay Territory and mentors featured as a keynote speaker and workshop presentations!! Traditional Voyaging Canoe Hikianalia Welcomed in San Diego, Oct. 30th - Nov. 15th 2018 InterTribal Youth and Greater San Diego Community welcome Hikianalia after she sailed more than 2,800 miles across the Pacific to the State of California carrying a message about the critical need to address climate change. Demonstrating the value of nature, the oceans and indigenous knowledge, the crew found their way to California on the solar and wind powered canoe using ancient Polynesian wayfinding techniques. The canoe and crew made a final stop in San Diego before returning to Hawaiʻi in December of 2018. Read more and see the pictures . . .
World Champion Big Wave Surfer, Greg Long, Clif Bar, Wildcoast, and San Diego Maritime Museum help create the connection between local communities and their coastline. In summer of 2018, Long joined Wildcoast and Native Like Water to share his love of the ocean with indigenous youth in the San Diego area. Youth got their hands wet (literally) by playing with marine life and doing science experiments in the San Diego Bay, and then exploring the marine-protected area of La Jolla before learning to surf in nearby waves ... with Long as their world-class teacher. Read more . .
InterTribal Youth Big Island Hawaií June 18-25, 2018 POSTPONED. For Youth (12-18) and Adult Youth Teachers/Mentors Hawaiian programs are leading the way in cultural-based curriculum and proving very helpful in western academic success. Our program to the Big Island was postponed due to the concerns and overactivity of Kilauea Volcano. There is a great cultural and educational significance to this natural occurrence. Learn more here . 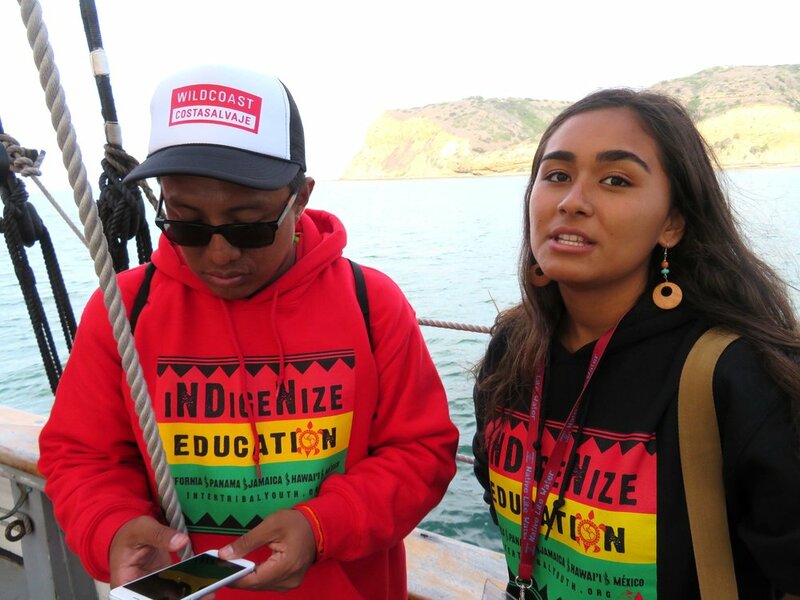 . .
InterTribal Youth Joins Hokulea World-Wide Voyage Homecoming and Presents at World Youth Congress, Oahu June 16-22. 2017, Youth from Agua Caliente Cahuilla, various Bands of the Kumeyaay Nation, Alaska, and Belize joined by Tribal Elder and Leaders present at world gathering in celebration of the greatest example of indigenous education and global unification, caring for Mother Earth - "Malama Honua". ITY Director Featured in Olukai's Cliff Notes: Founder of InterTribal Youth, Marc Chavez interview and photo essay by Cliff Kapono, Olukai Ambassador, Scientist, Artist, and Waterman. Between the native food, culture and surf, Cliff and co. were able to catch up about what brought this once “lost” LA boy south of the border. It was only then did Cliff realize just how volatile things were in the region. Read more. .
ITY and Tribal Nations of Panama Welcome the Hokulea at the Panama Canal. The Malama Honua World-Wide Voyage, January 2017, greets the people of Panama and crosses the Atlantic Ocean to the Pacific as they embark on their way home to Tahiti and Hawaii. More . . .
InterTribal Youth chosen by Haro BMX Bikes, Paul Cannon and Nahko Bear as recipient to a special Haro Bike Honoring Give-away. Honored youth awarded by Joe Haro, Nahko Bear and Paul Cannon on Dec. 7th at the Pala Skate Park. A special concert featuring Paul Cannon and Nahko Bear followed, the next day. Learn more . .
Open doors of opportunity for youth. If you are interesting in sponsoring a matching donation for youth scholarships, we have a list of youth with below poverty & financial need. Please contacts us and lets make an impact together.